Call me old-fashioned, but I love board games. I will choose an evening around the kitchen table playing Monopoly, Scrabble, or Blokus with friends and family over the latest video game any day of the week. The games themselves may not be as hi-tech and slick, but I care a lot more about the opportunity for face to face human interaction than I do about the latest CGI graphics. Plus, unless it's a racing game with an intuitive steering wheel-shaped controller (those, I like), I'm really pretty terrible at video games. It's a hand-eye coordination thing, or rather a lack thereof. Yeah, I've never even saved the Princess. Classic board games, on the other hand, bring out my competitive side. In fact, from time to time I've been accused of being too competitive. I mean, I will dominate you in a game of Monopoly or Scrabble, and I may or may not gloat a bit if I manage to fill my pie before yours in a spirited game of Trivial Pursuit. Things don't always go my way, though - not that I'm a sore loser (ok, maybe sometimes I'm a sore loser). I once demanded a "do over" round in Scattergories after coming up with a long list of witty, wise and wonderul "w" words that resulted in zero points because the chosen letter was "r." I must have been hooked on phonics that night, because I filled in the first category with the word "wrestling" and it was all down hill thereafter. No matter how original the answers, one gets no points for "w" words when the chosen letter is not "w." Of course, my distress over the mistake and the resulting blow to my score resulted in peals of laughter and no shortage of trash talk from everyone else in the room. As you might imagine, I did NOT get a "do over." So unfair! I couldn't resist this vintage bangle (also from the liquidation sale), and its cheeky little nod to Joan Crawford. It's engraved with the phrase "No Wire Hangers, Ever!" Like this dress (recently acquired from a vintage shop liquidation), my love of board games was born in the late 1970s. From Connect Four to PayDay, Sorry, Chinese Checkers and an obscure 1950s "Black Beauty" horse racing themed game that I played at my Grandma Coy's, I never met a board game I didn't like. Despite this fondness for friendly fireside competition, I never learned how to play Chess. I'm actually kind of embarrassed to admit that fact. After all, if the category on Family Feud was "board games," I'm pretty sure Chess would be the top survey answer. 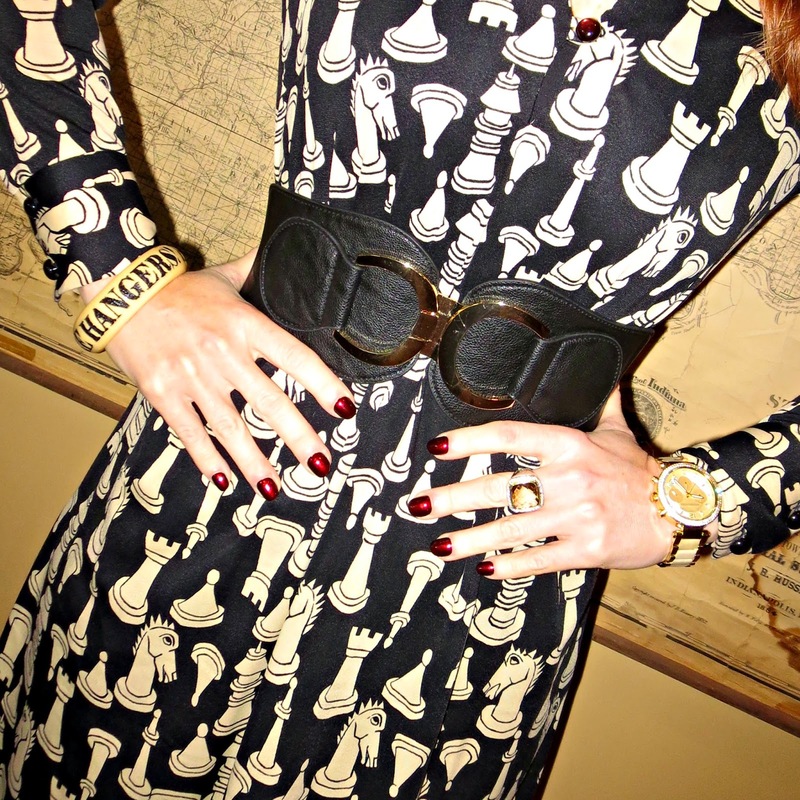 Even so, it was the chess-themed pattern on this wing collared polyester beauty that I found irresistible. Does that make me a poser? Maybe I need to find a local chess club that will take in a beginner...or maybe I just need to find a dress with Scrabble letters or Monopoly pieces all over it! Gotta say I am totally sad that this dress is vintage and not something I can run out and buy! I wish it was hanging in my closet right now! Found you via the IndyStar! Hi Kinsey, Thanks so much for checking out Red's Shoe Diaries! Every time I've worn this dress people have asked where they could buy it - not many 70s styles are so timeless!